The Invicta Elite Chronograph (1716) has a sharp look and quality feel which make it a handsome men’s accessory, but the real quality of this watch lays in its details. The Invicta Elite (1716) has a highly polished, stainless steel case which measures 51mm high, 44mm wide, and 13mm thick. Its pliable strap measures 21mm wide and stretches up to 8.75 inches in length. The strap is made of calf leather, giving it a comfortable and soft fit against your wrist. The Elite has three sub-dials, which track time in intervals of 60 seconds, 30 minutes, and 1/10 of a second. A small date display can be found at 4 o’clock. A carbon fiber dial, mother of pearl inlay, and highly polished stainless steel case give the Elite a beautiful sophistication. The sub-dials are breathtaking with their black mother of pearl backgrounds. 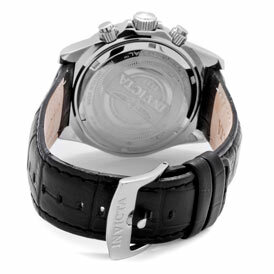 The black, leather strap gives a chic appearance between its color and the refined stitching. The black also brings out the carbon fiber face and contrasts handsomely with the silver case and bezel. The luminous silver-tone hands and markers stand out against the dark faced dial. Being luminous, these are highly readable even in low-light conditions. Less noticeable, the raised Arabic numerals and markers lining the unidirectional bezel shine silver. These call little attention to themselves as they mark the hours, but they are sizable enough to be legible. 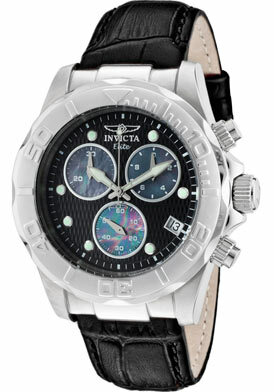 The Elite is reinforced with Invicta’s signature flame-fusion crystal, making it impact resistant as well as beautiful. The screw down case back and push/pull crown help to secure the watch against water, and the Elite can be submerged in up to 100 meters (330 feet) of water without flinching. Meanwhile, Swiss chronograph quartz keeps this timepiece reading precisely. 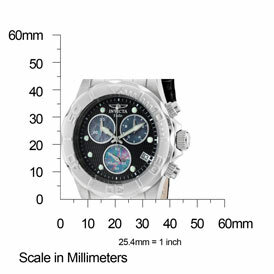 The Elite measures 51mm high, 44mm wide, and 33mm thick. 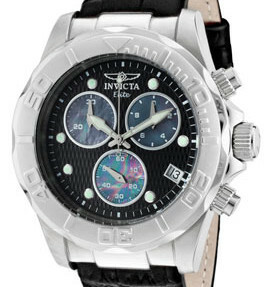 The Invicta Men’s Elite Chronogrpah generally retails for $895.00, but can be found online for a fraction of the price. Check sites such as: TheWatchery.com, royal-crown-watches.com, or BizRate.com for deals. It’s possible to find this handsome timepiece for around or even less than $150.00 with little to no cost for shipping. The Invicta Elite Chronograph (1716) has a chic black and silver design with mother-of-pearl inlays that make the watch extremely handsome. This timepiece gets a lot of notice and compliments are sure to follow. Its excellent quality, expensive look, and solid yet comfortable feel make this watch desirable already, but the fact that you can find it for a fraction of the retail price online makes it almost irresistible. It’s the subtle design details that really make this watch standout against the competition though. The dark mother-of-pearl inlays on the secondary dials make this a uniquely beautiful timepiece. In addition, the Elite has a strap made of genuine calf leather, which is very comfortable. The leather is more pliable and soft than most, giving it a flexible fit. This watch is fashionable of course, but it’s also durable enough to be used as a sport watch. The stainless steel case, buckle, and bezel combined with the screw on back, push/pull crown, and flame-fusion crystal make the watch impact and water-resistant. The large dial and contrasting silver hands make the watch quite readable. In low-light conditions, the luminous hands and numerals keep the watch visible. While its size can be a challenge for some, the date display is designed to be viewable with its black on white readout. Collectively, these elements mean the watch can follow you just about anywhere. The sharp and expensive look of the Invicta Elite (1716) make it a handsome men’s accessory, but the real quality of this watch lays in its details. The mother-of-pearl, calf leather, and careful stitching give this timepiece an exquisite look and feel that’s hard to match. From the flame-fusion to the water proof sealing and Swiss movement keep this watch ticking even in heavy use.